Go to a Webelos Woods weekend!! « Attend Outdoor Webelos Leader Training and learn what it's all about! Citizens have responsibilities and duties to their country. In the Cub Scout Promise, Webelos Scouts say they will do their duty to their country. Good citizens learn about their community, show respect for their flag, and show respect for the rights of other people. The Citizen Activity Badge is intended for two consecutive months of Den Meetings. « Pretend that your den is starting a new government. « Have the boys make their own flag. « Learn more about your community. « Teach the Wolf and Bear dens how to do a flag ceremony. « Plan and make a display on citizenship for Pack meeting. « Invite a highway patrolman or policeman to come to your den and talk about being good citizens. « Invite a new American citizen to come and talk to the den about his or her experiences in becoming a United States’ citizen. ü Have each boy make a list of all the states he remembers. ü After 5 minutes the one with the longest list wins. This game is much like the United States Game, but instead of naming states they are naming United States Presidents. After 5 minutes (or 2 or 3 minutes), the one with the longest list wins. P One team picks out a place on the US map. P They call out the name and challenge the other team to find it in 2 minutes. P If the other team finds the location in the time limit, that team gets a point. P If they do not find the location, then the team that chose the location gets the point. P The game ends when one team has 5 points (or as many points as you want to play to). « Divide the Webelos Scouts into teams, each with the same day's issue of a newspaper. « On the signal, the teams start a search for news items that illustrate the twelve points of the Scout Law [A Scout is Trustworthy, Loyal, Helpful, Friendly, Courteous, Kind, Obedient, Cheerful, Thrifty, Brave, Clean and Reverent.]. « The Scouts then cut out the articles. « The team with the most clipped articles wins. « Then, have a spokesman from each team discuss why they chose the articles they did and how those articles do illustrate the Scout Law. ü Divide the boys into two teams. ü Give each team a 3-by-5-foot flag. ü On a signal, the first boy hands the star side of the flag to the boy behind him and folds the flag. ü After it is folded, the second boy unfolds the flag and hands the star side of the flag to the boy behind him while he now folds the flag. ü Play continues until each boy has folded the flag. Most government buildings have some form of a tour. You might be able to combine the tour with your scavenger hunt. Divide the den into two or three teams and give the boys a reasonable time limit. Have them locate answers to questions as well as inexpensive available items. · What is the middle initial in the full name of our town' mayor? What does the initial stand for? · Bring back a piece of stationery showing our town's logo or crest. · Draw a picture of our state flag. · Where does the City Council meet? · What is the full name of the governor of the state? · Get a brochure or find out some information about trash pick up service? · Where in or on what floor of City Hall can you find __________? · Who runs the Water Department (or something else if you don't have one. We don’t where I live CD) and what does that department do? · What's on the top floor of the City Hall building? · Who takes care of snow removal/tree removal from city streets and what is their budget? Tell your Webelos that a new large island has been found near Hawaii. You and your Webelos Scouts have been asked to settle this island and form a new government. Each Webelos Scout will establish his own city within his own territory. Before den meeting, create a simple map of the island (include contour lines if possible). Show the boys the map and let each boy pick out his own territory. Start having the boys to determine the name of their island country and the names of each territory. Send home with each of your Webelos Scouts, an 18” by 18” piece of white linen material and some heavy wire. The material is for making their territorial flag. Boys could begin on designing their flags with markers, paints, etc. They should return the following meeting with definitions of each of these. Have the Webelos Scouts put their flags on display when they first arrive (a clothes line across the room is great). Discuss with the Scouts the government they want for their country (hopefully they have a name now). Try to encourage the different forms of government... Voting is a fun part. You could suggest that only people who own Fords can vote. After your Webelos Scouts have decided who gets to vote, then they need to decide if it will be an open or closed ballot. Once they do that, they’ve made their first two laws. Next they can vote for two flags. Tally the votes and the winning flag just determined the location of your capitol. The Webelos Scouts will get hungry, so you’ll need to talk about what foods are growing on our island. Coconuts? Sugar cane? Will anything else grow there? Are there animals there? If we’re trading with other countries, perhaps we’ll need to establish a foreign policy. We’ll need a Commerce Department to work out the transportation of our sugar cane and coconuts. Maybe we could trade with Japan from some Toyota trucks. We can’t trade coconuts for trucks, so we’ll need a monetary system. We’ll call that the Treasury Department. What will our currency be called? All these things and more can be discussed and decided by the Webelos Scouts... and be presented in Pack Meeting, too! Show the boys how to draw historic U.S. flags. (Show them a picture and see if they can draw it). While they draw and color, you can tell the story behind each flag. Many different flags have represented the United States at one time or another. But all the flags, and what they represent led up to the current flag, which was adopted in 1960 with the addition of a star representing the state of Hawaii, the nation’s 50th state. The Grand Union Flag (also known as the Continental flag) was the first flag chosen by George Washington to be flown at the commemoration of the Continental Army on New Year’s Day, 1776. It is a combination of the British King’s Colors and the thirteen stripes signifying colonial unity. Betsy Ross, a seamstress from Pennsylvania, has been credited with creating the first Stars and Bars, though some people question whether she did or not. As the legend goes, George Washington appeared on Mrs. Ross’ doorstep in June of 1776 with two representatives of Congress. They asked that she make a flag according to a rough drawing they carried with them. 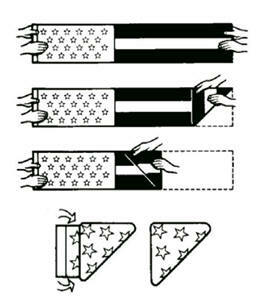 At Mrs. Ross’ suggestion, Washington redrew the flag design in pencil in her back parlor to employ the stars of five points instead of six points. Since there was no official flag during the first year of the United States, there were a great number of designs. The Betsy Ross Flag is the most well known of those, but the United States did not choose its first official flag until June 14, 1777 with the passing of the first Flag Act. This 13-Star flag became the Official United States Flag on June 14, 1777 – which is why we celebrate Flag Day as June 14th every year. The only president to serve under this flag was George Washington. It was our official flag for 18 years. Each star and stripe represented the 13 Colonies, which were united in 1776 by the Declaration of Independence. When Vermont (the 14th State in 1791) and Kentucky (the 15th State in 1792) joined the United States, a new flag was needed. Two stars and two stripes were added and the Star Spangled Banner became the new Official United States Flag in 1795. It had 15 stars and 15 stripes – the only flag to have more than 15 stripes. It was flying in 1814 over Fort McHenry when Francis Scott Key wrote our National Anthem. In 1818, Congress decided that it wasn’t practical to add a new stripe for each new State, and so they passed the Flag Act of 1818 that made the flag have 13 stripes and they specified that a new star would be added for each state. This is the standard that is still used today. On July 4, 1822, the 24-star flag became the sixth “Stars and Stripes” to fly over the United States of America. “Old Glory”, at first was a single flag the bore the name now familiar to us all. The flag belonged to Sea Captain William Driver. He received the flag in 1824. At that time he was about to sail from his homeport of Salem Massachusetts, on one of the trips that took him around the world. From that date on, the flag went with him on his ship “Charles Doggett” whenever he went. In 1837, after countless voyages, Captain Driver retired from the sea and went to live Nashville Tennessee. Of course, he took his flag with him and displayed it on holidays and on St. Patrick’s Day (March 17th, his birthday as well). He and his flag became well known in Nashville. When to Civil War broke out those who hoisted American Flags in Nashville were attacked by Southern sympathizers. Confederate soldiers searched Driver’s home on several occasions for his flag, but never found it. When Union forces entered the city, Driver ripped open a bedspread and revealed his flag that had escaped any harm. Seeing it float from the top of the Capitol building in Nashville, Driver declared “I am ready to meet my forefathers knowing ‘Old Glory’ and Tennessee have been saved for the Union”. After the war, the story of Captain Driver’s flag and its name spread by word of mouth and in books and newspapers. Although there is doubt about whatever happened to Old Glory, its name lives in the hearts of Americans. By July 4, 1912, the United States flag had 48 stars. President Taft, established proportions for the flag and provided for arrangement of the stars in six horizontal rows of eight each – with a single point to be upward. Today, whatever you choose to call it, it has 50 stars one for each state of the Union. It is the 27th Official Flag of the United States of America -- Our Flag. According to the story, George Washington's original pencil sketch for the flag indicated 6-pointed stars, a form he apparently preferred. Betsy Ross, however, recommended a 5-pointed star. When the committee protested that it was too difficult to make, she took a piece of paper, folded it deftly, and with a single snip of her scissors, produced a symmetrical five-pointed star. This feat of magic so impressed her audience that they readily agreed to her suggestion. The key is using an 8 1/2 by 10 inch paper (not 8 1/2” x 11” – it will work, but it won’t be “perfect” star!). This is a good badge to start the boy on when he joins the Den. The written requirements and readings may be done at home with parents. This continues the importance of parents involvement in the Webelos Den. This badge is also of interest to the leader, because he can learn much about his boys from their writings on what is meant by "all men are created equal" and on the Star Spangled Banner. The leader should keep in mind that all boys are different, so they will have different ideas and opinions on this badge. Each boy's "BEST" should be judged individually. A lot will depend on how well informed and enthusiastic the Webelos leader is, and how he presents the badge to the boys. This badge can be fun, or it can be just '`another piece of paper to write." It's up to you. · To foster citizenship in WEBELOS Scouts. · To teach boys to recognize the qualities of a good citizen. · To introduce boys to the structure of the U.S. government. · To familiarize boys with basics of American history. · To convince boys that laws are beneficial. · To encourage WEBELOS Scouts to become community volunteers. ü Discuss requirements of badge with boys. Decide on a good turn for school, church or community and plan how to carry it out. Boys make logbooks to record their work on the badge. ü Plan a special good turn for the next Pack meeting; such as setting up chairs, ushering, clean-up, etc. ü Visit a local government agency. Find out how it works, what service it provides, how it affects boys and their families. ü A campaign against litter is a "must" for good citizenship. Discuss how your Den can carry on such a campaign.. and do it. This could include making posters for display. litter clean-up, making litter bags, etc. ü Discuss the various organizations in your community, which help people. How are they financed and run? Do they use volunteer help? Visit one of these organizations. ü Discuss ways boys can be good citizens. Let them make lists of things they will try to do regularly. How much do you know about two of the greatest documents ever written: the Declaration of Independence and the Constitution of the United States? B) "We, the People of the United States..."
C) "When in the course of human events..."
D) "Four score and seven years ago...""
3: The Constitution of the United States was signed in What year? 4: What is the minimum age for a President of the United States, and in what document is this stated'? 5: Which amendment to the Constitution provided for the abolition of slavery'? 7: What is the maximum number of years a President may serve? 9: What legislative body has the sole power to impeach a President? Mark the best ending for each sentence. Using a copy of the Declaration of Independence, Bill of Rights or the Gettysburg Address; make a wall plaque by mounting one of these on 1/4" plywood shaped into the design of a scroll. Make your scroll slightly larger than your copy. Finish plywood by sanding, staining a natural color and varnishing or leave the wood grain and color show through by eliminating stain and just varnish. P Invite a guest speaker from a local board to explain his duties and tell the WEBELOS Scouts why he volunteers his time. P Buy a packet of used U.S. commemorative stamps. Distribute several to the WEBELOS Scouts and challenge them to discover the "story behind the stamp". At the following meeting allow each boy ample time to describe his stamps and their significance. P Attend a local city council meeting. P Have each WEBELOS Scout write a letter to his Senator or Congressman to express an opinion on an issue. It would be especially interesting if two WEBELOS Scouts wrote an opinion about opposite sides of the same issue. See what responses you receive. P Encourage WEBELOS Scouts to fly a flag at home particularly on appropriate flag holidays. P Arrange for the WEBELOS den to do a community service project. · Give some of the toys the WEBELOS Scouts may have made as part of the Craftsman badge to needy children. Use Craftsman skills to repair and refurbish toys for the same purpose. · Read to someone who cannot see. · Provide snow shoveling, yard care, errand service, or other aid to an elderly person or couple in your neighborhood. When the Stars and Stripes first became our national flag, no one was sure just what the design of the flag should be. Since the time of that first flag, official descriptions of the national colors have been very careful and clear. Not only is the design of the flag carefully described today, but there are many special rules for displaying it. The following questions are based on the universal flag code of the United States. See how many you and your WEBELOS den can answer correctly. Some of these questions are tricky. 1) The flag is raised (a) slowly; (b) briskly; (c) at any speed that is comfortable. 2) If you carry the flag in a parade and passed before the President of the United States, you would dip the flag slightly in salute to the President as you walked past him. True or False? 3) The flag must never be lowered no matter how bad the weather conditions. True or False? 4) The flag is never allowed to fly after daylight hours anywhere in the world. True or False? 5) When the flag is carried in a procession or on other occasions, it is escorted by an honor guard. True or False? 6) The flag's honor guard walks (a) on the flag's right; (b) just behind the flag; (c) on both sides of the flag. 7) If you are a Cub Scout, WEBELOS Scout, Boy Scout, or Explorer, you always give the Cub Scout, or Explorer salute to the flag even when you are not in uniform. True or False? 8) When you carry the flag in a parade with other flags, the U. S. flag must go on the left of and in line with the other flags. True or False? 1) (b) briskly - it's a happy occasion! 2) False. The flag is never dipped to anyone..
3) The U.S. Code states, "The flag should not be displayed on days when the weather is inclement, except when an all weather flag is displayed." All-weather flags are specially made to resist the elements and are generally labeled as such by flag manufacturers. Even flags labeled as being all-weather flags, however, can be damaged by high winds and extreme conditions. We recommend good judgment when determining whether a flag should remain flying during bad weather. 4) False. Although it is the custom to display the flag only from sunrise to sunset, there is no law prohibiting its being flown both day and night. 6) (c) on both sides of the flag. 8) False. It is carried at the right of the other flags or at the front and center of a line of other flags. One way to make this activity badge come alive is to get involved. A good citizen gets involved where he lives. Your involvement can start at any age and it can be almost any useful act. Now is a good time to plan a citizenship project for your Webelos den. · Often after a fire, flood, or other disaster many people will be without sufficient clothing. Generally, local authorities coordinate a campaign to get used clothing in serviceable condition for distribution to the victims. Councils and districts should cooperate with local authorities and not attempt to set up an independent project. · A natural follow-up to registration campaign is an effort to get every eligible voter to vote. This calls for an educational and promotional campaign aimed at reminding citizens of their right and duty to vote. The campaign must be non-partisan. Before the election distribute get-out-the-vote materials. On election day, Scouts may be stationed outside polling places to "baby-sit" young children, hold packages, assist elderly or handicapped people, and provide "I have voted" badges to voters, leaving them as a reminder to others. · In cooperation with fire departments, install amber reflectors (or other distinctive devices) over the front doors of homes where handicapped persons live. Then if a fire breaks out, the firefighters will know immediately that a handicapped person lives there. A similar device may be placed on the door of the person's bedroom to help firefighters find it in an emergency. Fire departments generally provide the insignia, usually placed on the front downstairs window near the door or on the glass of the front door. A similar device is placed on the window of the invalid's room. Caution: Be sure you have approval of everyone living in that home before you place markers. · In many communities, new and used but still usable toys are collected for` distribution to needy children at Christmas. Units may assist by making pickups of toys, making posters to advertise the campaign, helping to stockpile toys, cleaning and repairing used toys, and delivering toys to the agencies that distribute them to poor children. Each youth member may also be asked to contribute one usable toy. « Buy a bulk of small plastic flags. « Divide them up to all the den members during the closing ceremony. « Tell them to carry the flags around this week and give them to people who are being "Good Citizens," explaining why. Complete each line by inserting duty or right in the blank. The_______ to obey all laws. The_______ to equal protection of laws and equal justice in the courts. The_______ to respect the rights of others. The_______ to inform yourself on issues of government. The_______ to be free of arbitrary search and seizure. The_______ to equal education and economic opportunity. The_______ to serve on a jury if called. The_______ to vote in elections. The_______ to serve and defend your country. The_______ to free speech, press, and assembly. The_______ to assist agencies of law enforcement. The_______ to a lawyer of your choice and a prompt trial if accused of a crime. The_______ to practice and teach the principle of good citizenship in your home. The Showman Activity Badge offers a choice of puppetry, music, or drama. A WEBELOS can pick the area that suits him best. Showman Activity Badge is in the Mental Skills group. The Showman activity badge has something for every Webelos scout. For the natural actor there is drama, for the shy boy there is puppetry, and for every boy there is music. The aim of the badge is not to produce skilled entertainers, but to expose boys to theater and to music arts, to help them build self-confidence, and of course, to have fun. Everyone loves a show and most all boys have a generous chunk of ham in them and want nothing better than a chance to let it out. If you don't give them a chance under controlled conditions, they will take it when you least expect they want it. The Showman activity badge gives them a chance to let out the hidden barely Shakespeare, Jerry Lewis, Leonard the Great or what ever happens to be their style. It allows them to express themselves musically be it kazoo or Steinway. Providing the entertainment for the pack meeting will be a challenge gladly met by Webelos Scout boys and the sillier the better! The badge covers most of the field of entertainment and acquaints the boys with ways of putting on various shows or skits. Making the props also can be used as part of the Craftsman badge. Skits and Songs are covered elsewhere in the Bugle. Every conscientious leader of boys is working to further develop the whole boy- physically, emotionally, spiritually, and mentally so he will be prepared to take his place as a well-adjusted member of his social group. The Showman badge offers the opportunity for a boy to develop his creativity and broaden his base of aptitudes. ü To instill an appreciation of the fine arts. ü To expose boys to entertainment professions. ü To expand the imagination and creativity of WEBELOS. ü To increase boys' self-confidence in front of audiences. ü Junior and Senior high school plays. ü Make up a Webelos band to entertain at a pack meeting. ü Learn magic tricks to do as a skit. Or take your magic show on the road to a residential center for seniors or children. ü Make a video tape of a play the WEBELOS write and perform. Show it to parents or in a demonstration corner of a pack meeting. ü Invite an artist, and/or a musician to a den meeting to tell about their profession or hobby. ü Write and/or perform a skit complete with scenery and costumes. ü Attend a folk music festival. Learn to sing a folk song. Learn about the history of the song. ü Invite the boys to tell about the instruments that they play. ü Make an audio tape of a radio program the boys perform. ü Make some homemade band instruments - try to play a tune on them. ü Invite an actor or drama teacher to explain stage directions. ü Ask a clown, actor, or make-up artist to show the den how to apply stage makeup. ü Learn how to make sound effects. ü Learn how to make other special effects, lighting. ü Videotape a short movie. ü Invite a high school drama teacher to explain and demonstrate make-up techniques. ü Attend a high school play or concert. ü Ask a Shriner clown to give a talk on clowning and give a demonstration. ü Write a puppet play and make the puppets to act it out. ü Put on an advancement ceremony for your Pack meeting. ü Talk about sound effects and let the boys try some of them. ü Use a tape recorder to tape the boy’s voices and let them hear how they sound. ü Visit a TV or radio station and watch programming in action. ü Have a story-telling session. Have each boy come prepared to tell the best true-life story he knows about something that happened to himself or a friend or family member. This is an opportunity to emphasize the importance of good listening and the value of sharing ideas. A dramatization using four Webelos, who stand in a diagonal line at one side, facing the audience, and the Webelos Leader, who is facing the Webelos and the audience on the other side. W.L. : David, how would you set out to do a good turn? W.A. : John, how would you get started on a camp out? W.L. : Ray, how would you start on a hike? W.A. : Mike, how would you start out to achieve your first activity badge? W.L. : Yes, it is as simple as that to make a thousand mile journey, to run a race, to learn a trade, to meet new people, to climb a mountain, to create a masterpiece, to build sky-scrapers, to design a spaceship. Yes to do anything worthwhile, there is always a first step, and it is the most difficult one to take. WA: If you are to progress in life, or in Tigers, Cubs, Webelos, or Boy Scouting, you must first face your goal and then get started with that all important first step! Cub # 1: We will never bring disgrace to this, our city, by any act of dishonesty or cowardice. Cub # 2: We will fight for the ideals and sacred things of the city, both alone and with our companions. Cub # 3: We will revere and obey the city's laws. Cub # 4: We will try unceasingly to quicken the sense of civic duty in others. Cub # 5: In every way, we will strive to pass the city on to our sons, greater and better than it was when our fathers passed it on to us. The Cub Scout literature has poems and stories that can be used for skits, but the public library has a lot more material. Ask your librarian for directions to the literature the theater sections of the library. The youth or juvenile sections of the library also has material that is more suited to the age of the Webelos Scout. A good skit is really a play in one act and can be more readily handled by 9 and 10- year-old boys. The Cub Scout How to Book contains some good ideas on how to write your own skit or one act play. Let the Cub's be creative. They can make the play up about anything they are interested in, sports, Scouting, a silly moment in the Den meeting, etc. Making costumes and putting on "stage makeup" makes the task more fun and enjoyable. In each cup of a muffin tin, put 1 teaspoon of cornstarch, 1/2 teaspoon each of cold cream and water. Add a different color food coloring to each cup. Hot glue large pom poms to finger tips-palm side of glove. Glue on small pom poms for noses. Then glue on ears and eyes. Dot nostrils on each pig with a black permanent marker. Use your creativity to create other glove-finger puppets, like Goldilocks and the Three Bears, Jack and the Beanstalk, etc. Cut a strip of corrugated cardboard with large corrugations, 8" long and 1 1/2" wide. Cut 8 straws into the following lengths: 8 1/2", 73/4", 6 3/4", 6" 5 1/4", 4 1/2" 4 1/4"
Push the straws between the sections of the cardboard beginning about 1/2" from one end and leaving four empty corrugations between straws. The shorter the vibrations, the higher the pitch. To play, blow over the straws. 1. Using the 9" size pan as the base for the mask, have the Scouts imagine all the facial features that might appear on the mask. Have them draw out a design for their special creation. 2. If any embossed design is used, place the pan on a stack of newspaper for support. Using the nail or a ball-point pen, use firm, even pressure to draw the design on the plate. Enough force should be used to bend the plate out on the other side, but be careful not to puncture to pan. 3. Cut shapes for added features from other pans. The pot-pie size is great for this part. The shapes can be cut from paper first to be used as a guide for cutting the tin. 4. Use small brass fasteners to connect the shapes to the base of the mask. Make small nail holes in the pieces of the pan where they are to be connected. Push the fastener through both pans to make the connection. 5. Larger brass fasteners can be used for additional decoration. Foil wrap or tinsel may also be used for details. 6. Tape a tab ring pull from a soft drink can to the back to use as a hanger for the mask. Find the capitalized words below in the puzzle above.